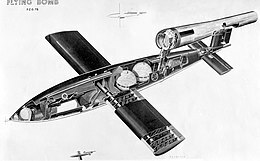 For descriptions of the individual weapons, see V-1 flying bomb, V-2, and V-3 cannon. 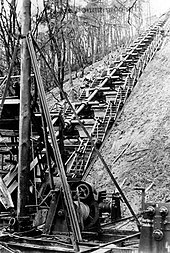 V-weapons, known in original German as Vergeltungswaffen (German pronunciation: [fɐˈgɛltʊŋsˌvafṇ], German: "retaliatory weapons", "reprisal weapons"), were a particular set of long-range artillery weapons designed for strategic bombing during World War II, particularly terror bombing and/or aerial bombing of cities. They comprised the V-1, a pulsejet-powered cruise missile; the V-2, a liquid-fuelled ballistic missile (often referred to as V1 and V2); and the V-3 cannon. All of these weapons were intended for use in a military campaign against Britain, though only the V-1 and V-2 were so used in a campaign conducted 1944–45. After the invasion of Europe by the Allies, these weapons were also employed against targets on the mainland of Europe, mainly France and Belgium. Terror bombing with V-weapons killed approximately 18,000 people, mostly civilians. The cities of London, Antwerp and Liège were the main targets. They were part of the range of the so-called Wunderwaffen (superweapons or 'wonderweapons') of Nazi Germany. Beginning in October 1943, launch sites for the V-1 were constructed in Northern France, along the coast from Calais to Le Havre. Aerial bombing attacks on these sites by the Allied airforce were only partially successful and by June 1944 they were ready for action. 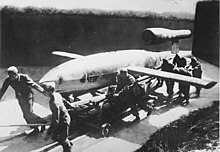 Prompted by the Normandy Landings of June 6, in the early morning of June 13, 1944, the first V-1 flying bomb attack was carried out on London. Ten missiles were launched of which four reached England. The first of these impacted near Swanscombe, causing no casualties. At Bethnal Green, however, a bridge was destroyed and six people killed and nine injured. After the 15th the attacks became sustained at a rate of about 100 a day. With the first attack the British put their pre-planned Operation Diver (after their codename "Diver" used for the V-1) into action. The buzzing sound of the V-1's pulse jet engine was likened by some to "a motor cycle in bad running order". As it reached its target and dived, the sound of the propulsion unit spluttering and cutting out, followed by an eerie hush before impact, was quite terrifying, though the silence was also a warning to seek shelter (later V-1s were corrected to have the originally-intended power dive). At least one business in London advertised how quickly a patron could access a nearby shelter. Despite this, the cloudy and rainy conditions of June and July aided the effectiveness of the weapon and casualties were high. By late August a million and a half people had left London and the rate of work production was affected. By the late summer and autumn, however, increasingly effective countermeasures against the V-1 were taken and people started returning to London. A total of 9,251 V-1s were fired at targets in Britain, with the vast majority aimed at London; 2,515 reached the city, killing 6,184 civilians and injuring 17,981. Croydon to the south, on the flight path of the V1s suffered severely taking 142 hits. For use of the letter V to designate experimental (German: Versuchsmuster) V-2 rockets, see List of V-2 test launches. V-2 rocket launching sites were set up by the Germans around The Hague in the Netherlands on 6 September 1944. The first was launched from here against London on 8 September 1944 and took an estimated 5 minutes to fly the 200 miles from the Hague to London where it struck at 6:43pm on 8 September on Chiswick causing thirteen casualties. As the V2 explosions came without warning, the government initially attempted to conceal their cause by blaming them on defective gas mains. However, the public was not fooled and soon began sardonically referring to the V-2s as "Flying gas pipes". By October the offensive became sustained. 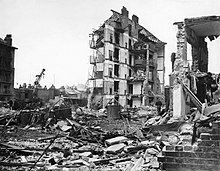 A particularly devastating strike was on 25 November 1944 when a V-2 exploded at the Woolworth's store in New Cross Road, killing 168 people and seriously injuring 121. Intercepting the supersonic V-2 missiles in flight proved virtually impossible and other counter measures, such as bombing the launch sites, were fairly ineffectual. Sustained bombardment continued until March 1945. The very last missiles arrived on 27 March 1945, with one of them killing 134 people and injuring 49 when it hit a block of flats in Stepney. 1,115 V-2s were fired at the United Kingdom. The vast majority of them were aimed at London, though about 40 targeted (and missed) Norwich. They killed an estimated 2,754 people in London with another 6,523 injured. A further 2,917 service personnel were killed as a result of the V weapon campaign. Since the V-2 was supersonic and could not be heard (and was rarely seen) as it approached the target, its psychological effect "suffered in comparison to the V-1." The V-weapon offensive ended in March 1945, with the last V-2 landing in Kent on March 27 and the last V-1 two days later. In terms of casualties their effects had been less than their inventors hoped or their victims feared, though the damage to property was extensive, with 20,000 houses a day being damaged at the height of the campaign, causing a massive housing crisis in south-east England in late 1944 and early 1945. The existential horror of the V-2 attack on London is the theme of Thomas Pynchon's novel Gravity's Rainbow. 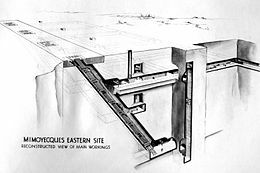 The V-3 cannon, also designed to fire on London, was never used for this purpose due to Allied attacks on the launch facilities, especially the fortress of Mimoyecques, and the offensive in northern Europe in 1944, overrunning the launch sites. Consequently, its use was diverted, in the winter of 1944, to bombard Luxembourg, with minimal results. ^ "V-WEAPONS (CROSSBOW) CAMPAIGN". All World Wars. Retrieved 19 October 2008. ^ "History of the V-terror in Belgium". ^ Neufeld, Michael J (1995). The Rocket and the Reich: Peenemünde and the Coming of the Ballistic Missile Era. New York: The Free Press. pp. 137, 237. ISBN 0-02-922895-6. ^ Henshall, Philip (1985). Hitler's Rocket Sites. New York: St Martin's Press. p. 128. ^ Johnson, David (1982). V-1, V-2: Hitler's Vengeance on London. Stein and Day. p. 80. ISBN 0-8128-2858-5. ^ Irving, David (1964). The Mare's Nest. London: William Kimber and Co. p. 288. ^ McGovern, J (1964). Crossbow and Overcast. New York: W. Morrow. p. 80. ^ King, Benjamin (2009). Impact: The History Of Germany's V Weapons in World War II. De Capo Press. p. 244. ISBN 0786751673. ^ Wade, Mark. 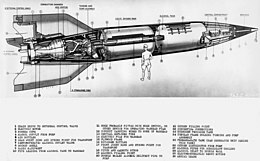 "V-2". Encyclopedia Astronautica. Retrieved 21 October 2008. Wikimedia Commons has media related to World War II technology.